Social justice. Are we listening? 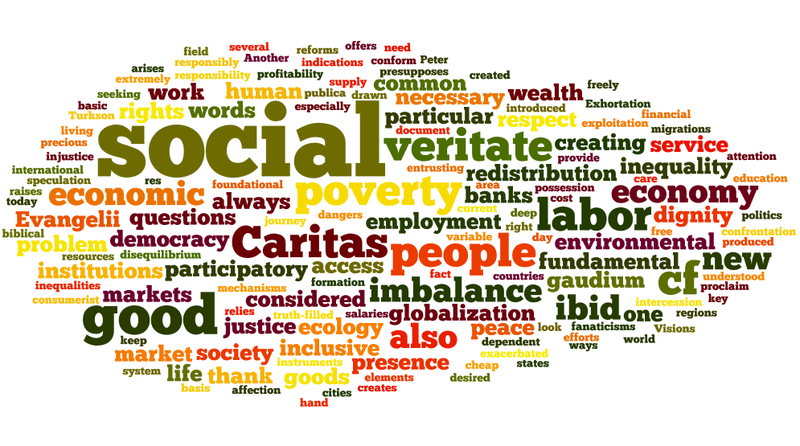 A word cloud from the social encyclical of Benedict XVI, Caritas in Veritate. It seemed not long ago that Pope Francis set off a firestorm of controversy around the question of social justice. That seems to have died down now. Of course, he keeps speaking, but are we really listening? If you weren’t paying attention, you may have missed a classic Pope Francis moment last week. Speaking on the anniversary of Pope Benedict XVI’s social encyclical, Caritas in Veritate, Francis called for “deep reforms” in our economic and public life. One would have thought that after a speech in which he once again called for “redistribution of wealth” and “redistribution of sovereignty”, there would have been controversy to follow. Instead there was uncanny silence. He also had harsh words for poverty and inequality, saying that inequality threatens to erode our democracies. He ended his speech with a heartfelt plea to “keep alive the concern for the poor and social justice”. No doubt about it, Pope Francis keeps talking about social justice. But, are we receiving his teaching? Do we believe that social justice is a meaningful term, that it has something to offer in terms of shaping American society, the economy and public life? Pope Francis clearly does. In the same speech, he defines social justice as the difference between a society based on exclusion and one founded on inclusion. Groups supported by the Catholic Campaign for Human Development struggle on the border between inclusion and exclusion. They work to stretch the border of fairness and dignity to more and more communities. They certainly know what a society built on exclusion looks like. Unemployment. Anxiety. Job insecurity. Drugs. Stolen wages. Excluded immigrants. Environmental damage. Catch up with the bills. Not making rent. A criminal record that comes back to haunt. Expensive education. No time to think about family. No time to think about community. These are the hard truths of social injustice. You only come to know them by living its harsh reality or by exercising solidarity with those who do. But CCHD groups also appreciate the hard won truths of social justice. Community. Economic empowerment. Jobs. Participation in public life. Education. Health. Culture. Fairness. Justice. Raising a family with confidence. The power to change one’s life for the better. For Pope Francis, social justice isn’t a detached, abstract discourse. As he says, it’s about “overcoming the structural causes of inequality and poverty.” It’s about putting the pieces of a broken society back together. It’s about building “an economy and a market that does not exclude people, and which are equitable.” The question of social justice is not a grandiloquent discourse on the theological conditions of the perfect society. It is about how to live and love in a broken world. A word cloud from a speech of Pope Francis on the Church’s social mission. Because we have put profit before people, competition before community, there are those who suffer exclusion from our markets and from our democracy. For the bishops, social justice requires society be molded so that all can participate in our economy and public life. Participation and inclusion are the yardsticks of social justice. Do we want a society based on inclusion or exclusion? Our commitment to love like Jesus demands we hear the question. Ralph McCloud is the executive director of the USCCB’s Catholic Campaign for Human Development. Learn about poverty in the United States and what CCHD groups are doing to address it at PovertyUSA and PobrezaUSA.